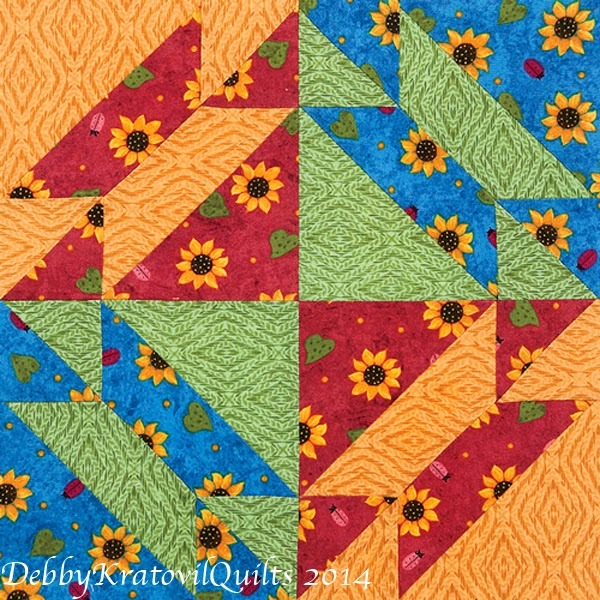 Even after all these years (22) of having my quilts published, it is still a treat to see them in print. I am especially happy to have one of my favorite magazines feature one of my blocks. This is the fourth time I've had this privilege and it still makes me smile! 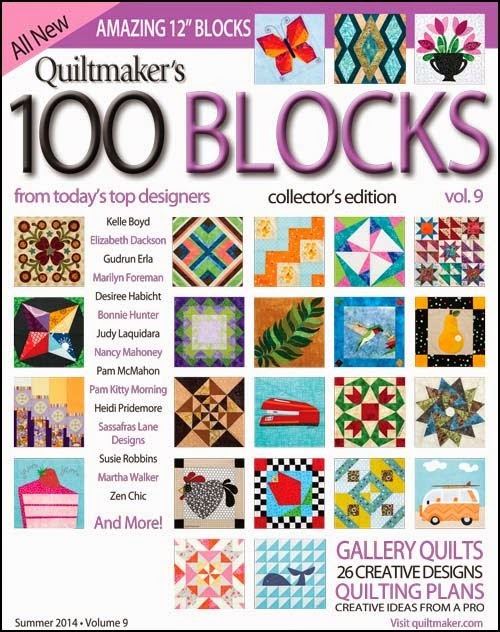 Quiltmaker’s 100 Blocks Volume 9 is the newest issue of this fabulous magazine. 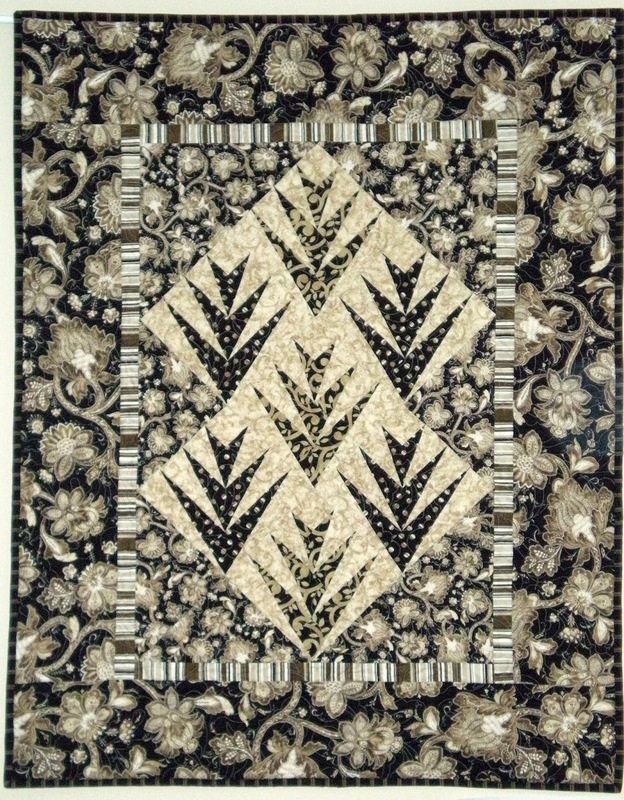 Honestly, I think a magazine is the most bang for the quilting buck around. All the blocks in this magazine finish to 12" so the possibilities are endless. 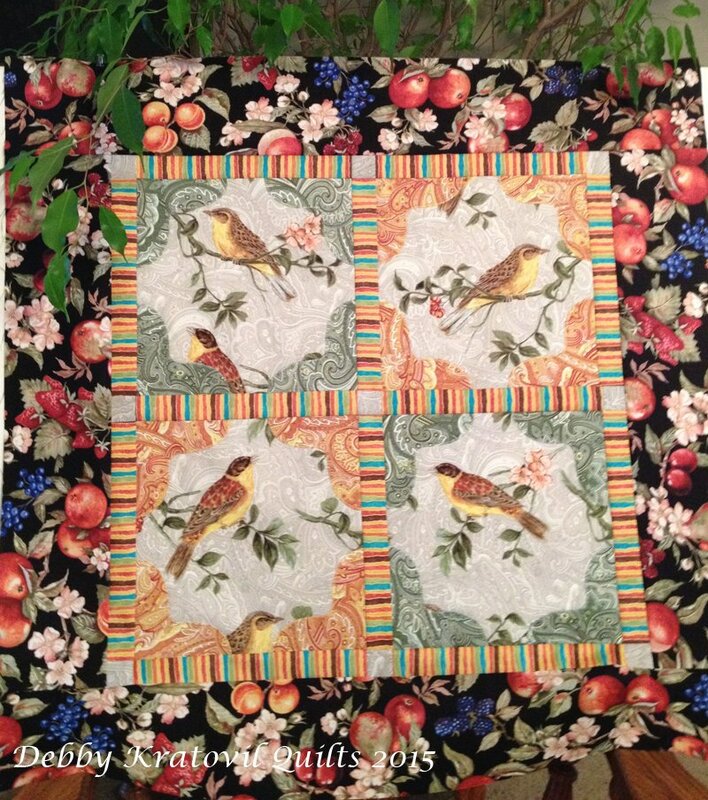 Many thanks to June Dudley, Kelly Eisinger, Carolyn Beam, Diane Harris and the rest of the Quiltmaker staff for making each issue somehow better than the last. Kudos to you all! 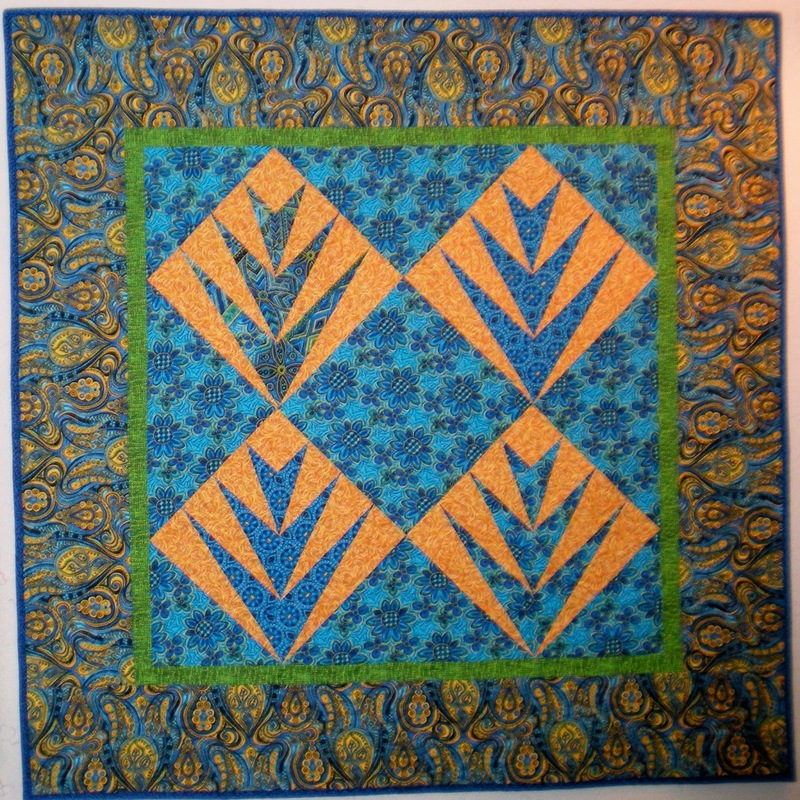 I selected four fabrics and used a traditional pattern that I made into a quick technique without the "funky" templates typically needed for those odd shaped patches. The size designated was 12. 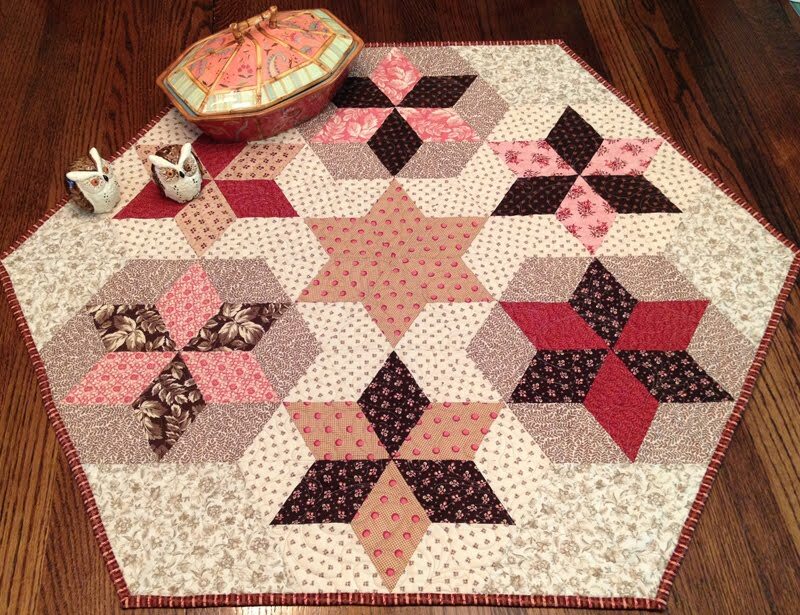 This Gretchen pattern can be made into any size because it uses two different triangles and some quick rotary cutting tricks. 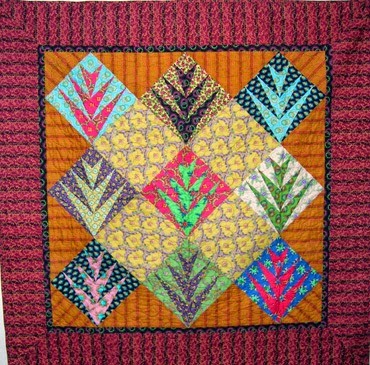 The quilt below was gifted to my son in law Dani's sister and new husband - Spaniards who live in Mexico. They hung it on their bedroom wall the first day they got back home! Made me feel so good! Don't you just love the positive-negative movement of this block? 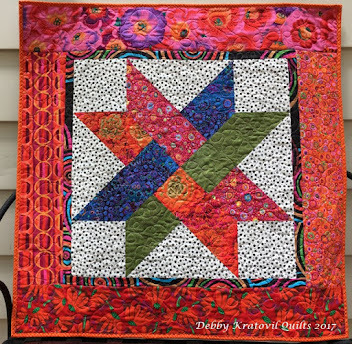 Follow the 100 Blocks Blog Tour daily April 28 - May 2, 2014 at The Quiltmaker Blog Quilty Pleasures for inspiration, ideas and giveaways galore (that's another way to say THEY HAVE PRIZES). 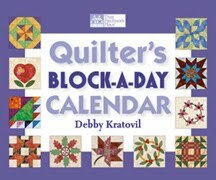 I donated copies of my 2 books and Block a Day calendar CD. But I'm also going to give away a few myself right here. What are they? 3. You don't have to be a follower, but I do give away a lot of FREE patterns, tutorials and prizes every week, so go ahead and sign up using the "Follow by Email" link over on the right or just sign up using the "Follow Me on Bloglovin" link. (Forget the Google follower signup - they no longer work) Then you won't miss a thing. I will announce the winners after the Blog Hop is finished, on May 2. And I use the Random Number Generator, weed out duplicate postings and no-reply bloggers without emails (yes, I do). 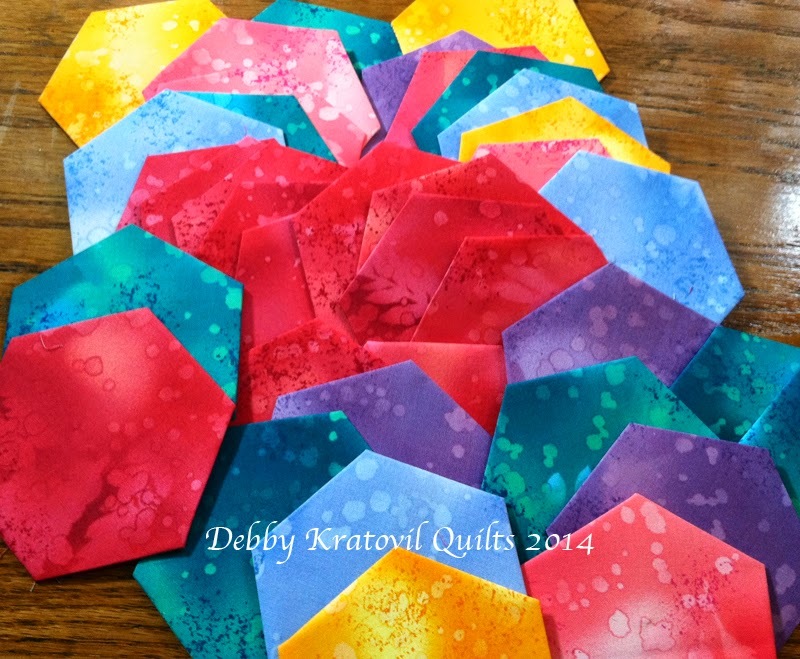 Thanks for stopping by and now go visit the Quiltmaker blog site (Quiltmaker Blog Quilty Pleasures) for more inspiration! If you are a no-reply blogger and don't leave an email, you are not eligible to win a prize. I'm sad that there is no way for me to reach you should your number be selected. I DO NOT sell or loan or give away my emails to anyone! 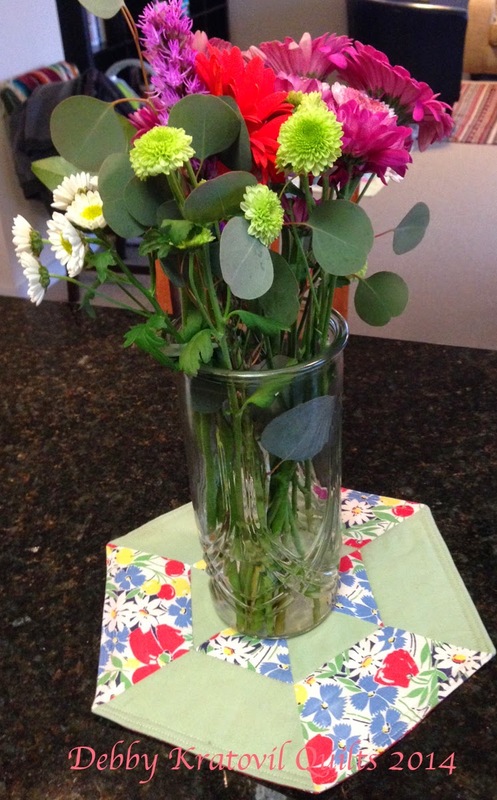 Today is the first day of the Flower Favorites Blog Hop. 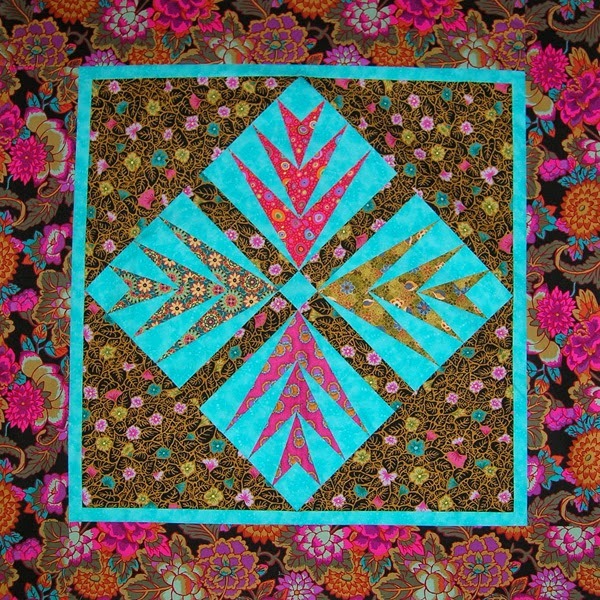 I was invited to make a block using any Benartex fabrics, as long as the block said "flowers." 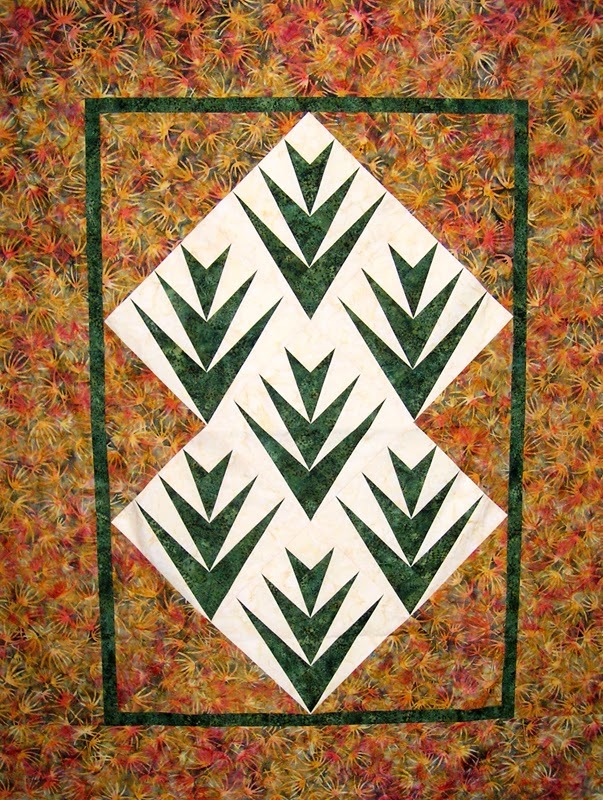 Since I was on a tight schedule, I chose to work with some Fossil Fern hexies (no kidding!) I had already completed. The Hop lasts for a week and includes a lot of inspiration. 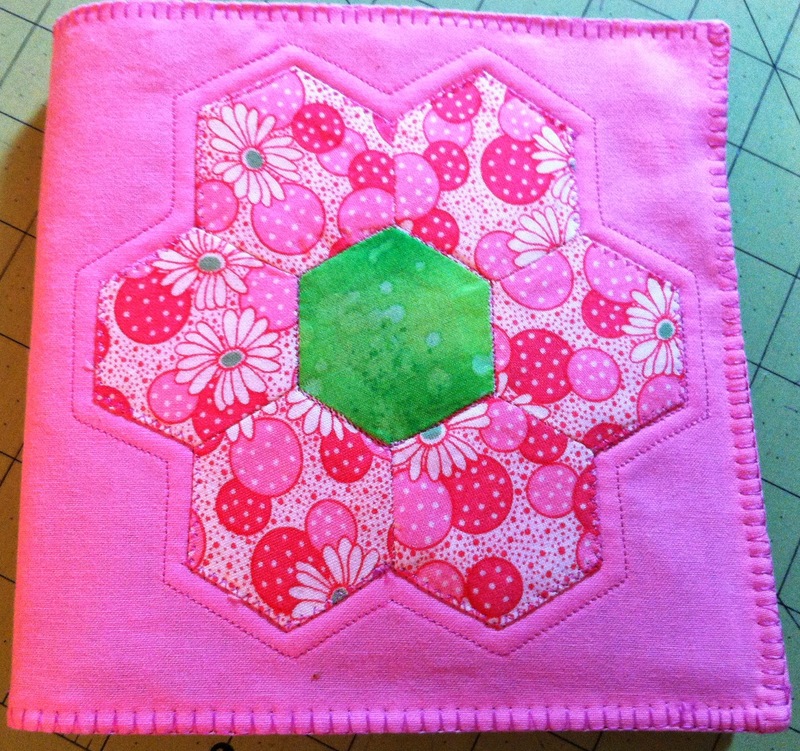 Go see what I've done at the Sew in Love with Fabric blog. Then come back and tell me about it. IF YOU ARE A FOLLOWER of their blog, let me know. 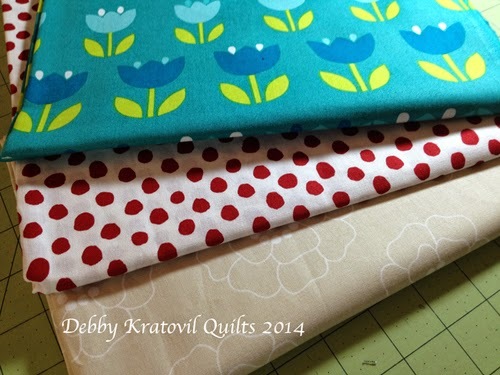 You are entered into the contest to win a fat quarter bundle of Palm Springs (there are 38 different fabrics - not just the three I chose to feature today). If you visit their Facebook page and "like" them (or already follow them on Facebook), let me know that, too. You can enter to win a second time. Contest is over May 6th. Make sure I have your email (Google accounts automatically show up). You have two chances to win: Follow Benartex on either their Facebook page (1 chance) and/or Blog page (2nd chance). Those are the rules (which I didn't make up). It never gets old - I've been publishing in magazines for 22 years (over 1,000 times) and I still enjoy seeing my name in print. But more than that, seeing one of my projects get her day of glory is so much fun, too! For the 3rd time I've had something in this fresh, modern magazine. 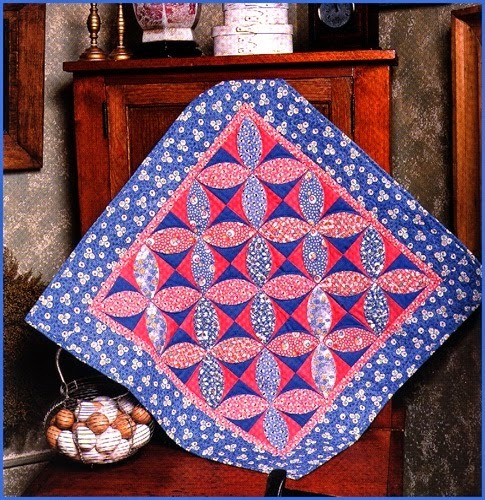 My little English Paper Piecing needle book appears on page 61. 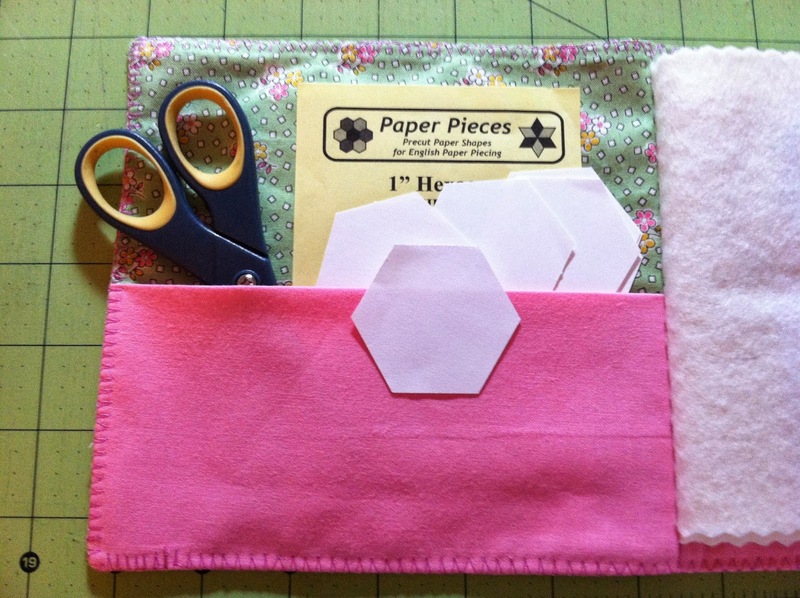 I enjoyed sewing it and using it this past summer to carry my English Paper Piecing supplies. Now she's come back home after her photo session at Modern Patchwork Magazine. It's just as cute inside! Holds my papers, scissors, needles and pins. 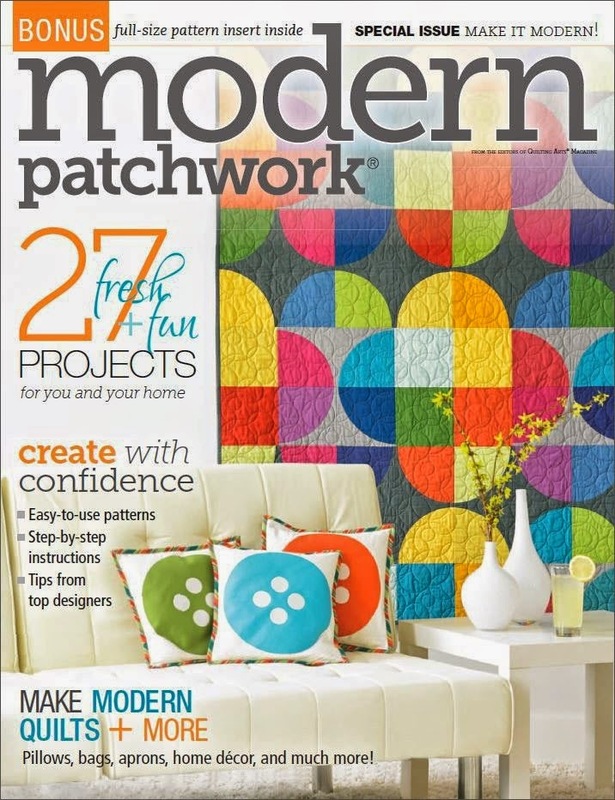 Those are batting "pages"
Check your local newsstands for your copy of Modern Patchwork Magazine. Or visit the Interweave internet site to see how you can order your hard copy or even download a digital version. This has become one of my very favorite magazines (no - not because they publish my stuff!) 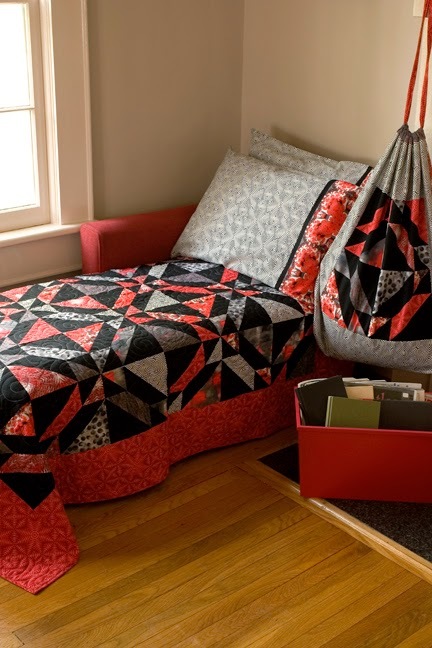 So many different items - not just quilts. Something for everyone. 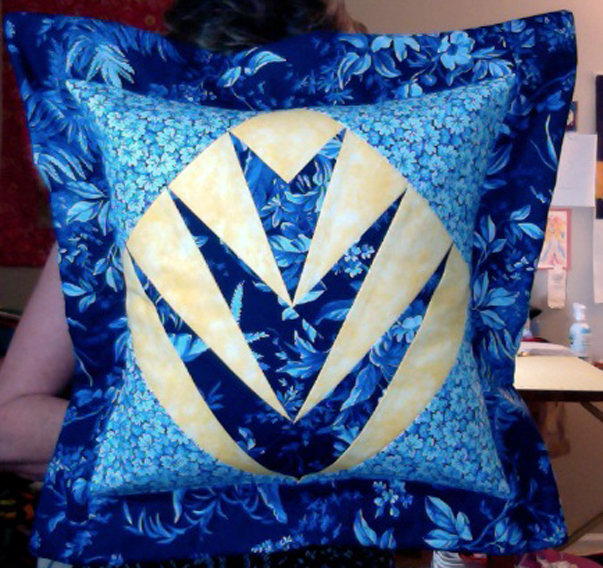 Back to sewing for me. Yes. 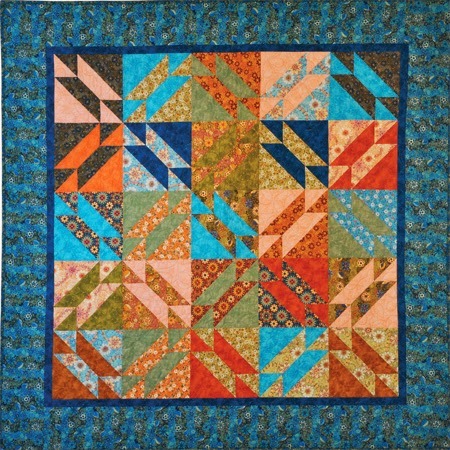 You can see that I have made a LOT of these blocks and quilts. I happen to enjoy the block when I can paper piece it. I thought I'd show them to you for Easter. It's Easter. Hallelujah. He is risen. 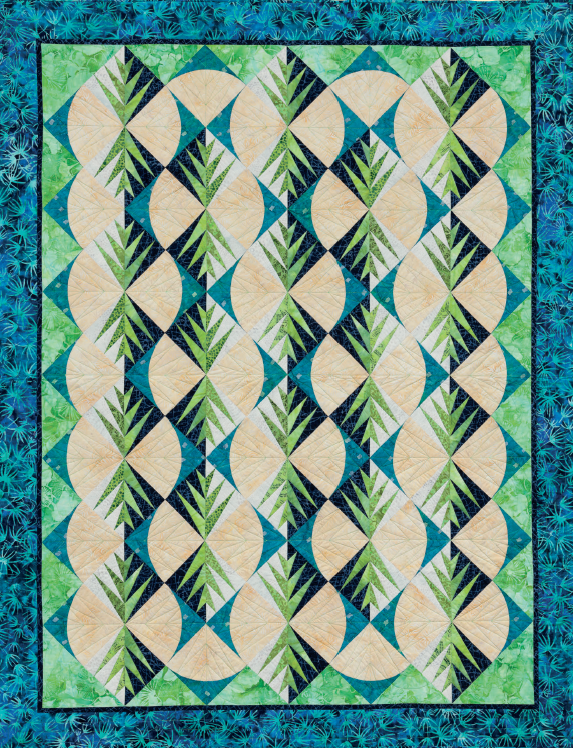 The Palm block is a traditional block that has been historically pieced with intricate templates and in two sections (with the seam running through the center diagonally). 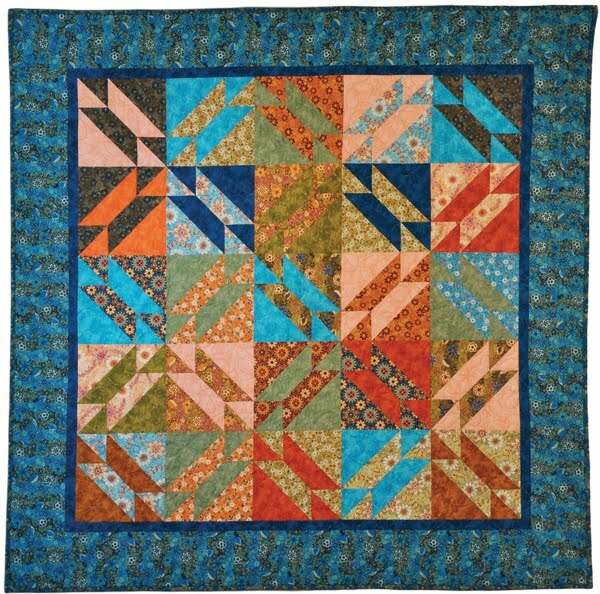 I redrafted the block in various sizes for foundation paper piecing in an off-center log cabin arrangement of the patches. Very quick and the points are very pointy. 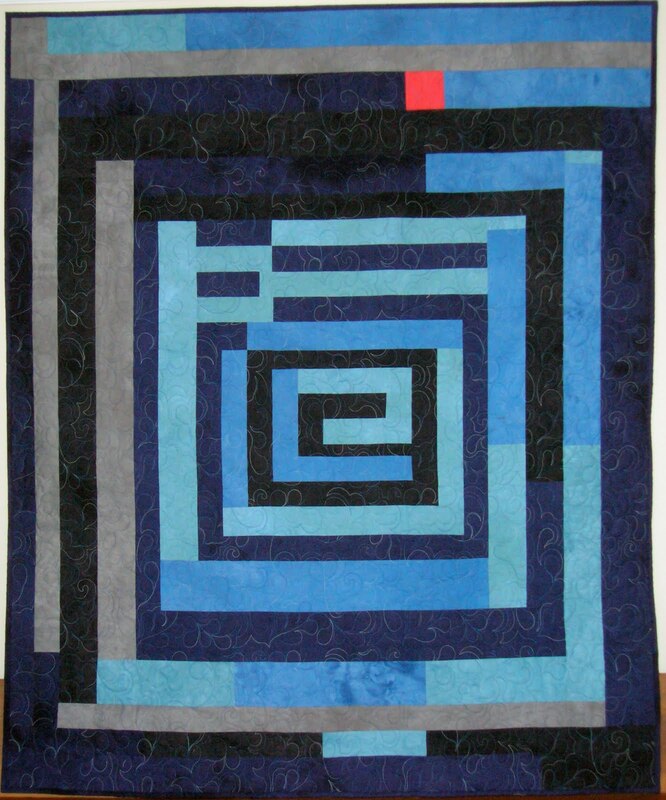 I've made several quilts over the years. Here are some of them. They all sing "Hallelujah!" 7 blocks set on point. Sold this top to a friend who LOVED it! OK. Don't panic. You have to remember that I do this for a living, which means that when I sew I find someone in the industry (fabric company, magazine, publisher) who will pay MONEY for my design. I enjoy what I do, but I use what I do to make enough to pay the bills. Not a lot of money, but enough to keep the wolves from the door. And that makes me sing HALLELUJAH everyday. I don't take it for granted, that's for sure. Actually, it's March SNOW brings April flowers! The backyard in my rental house is a total jungle past the deck. My husband often says that if we owned it we would just nuke the entire thing and start from scratch. 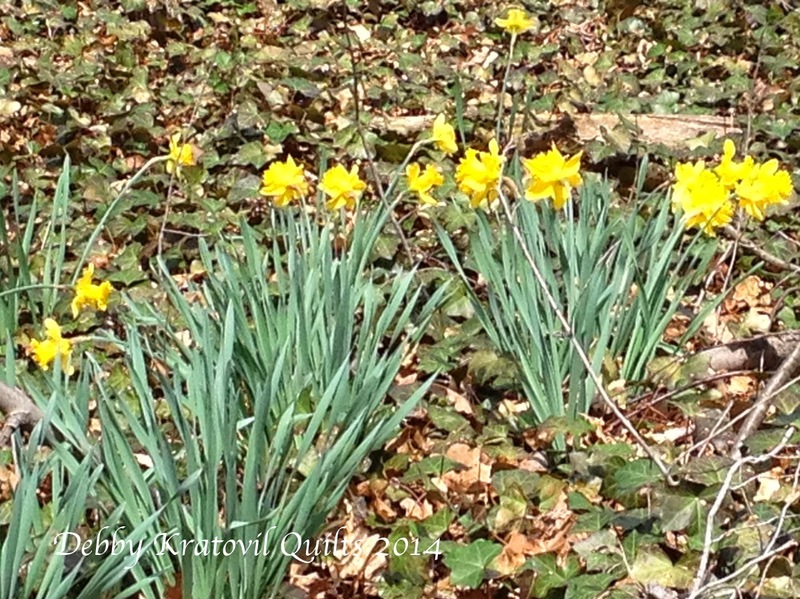 (We owned homes for 25 years and spent hundreds of hours doing all that improvement stuff) For now, I just enjoy not having to mow it and seeing the daffodils growing wild. My daughter Audrey sent this pic to me this morning. She loves to buy flowers at the grocery store (she lives in an apartment). 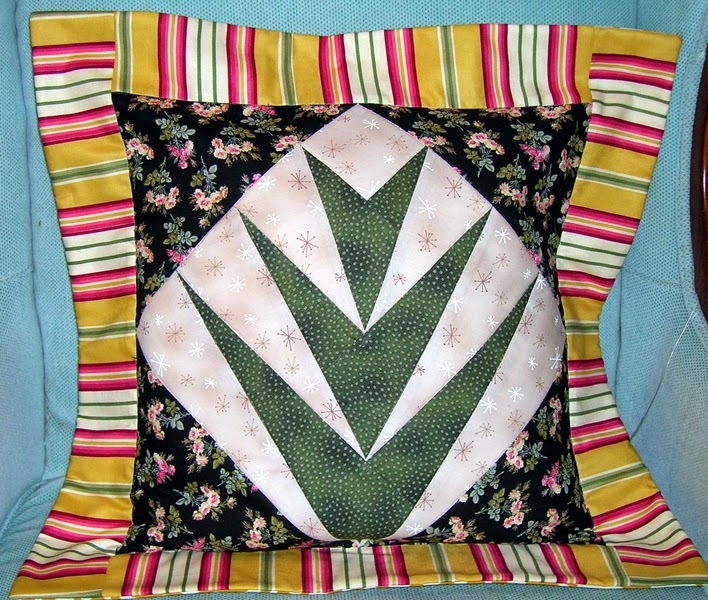 She wanted me to see the spiderweb trivet I made for her a few years ago using my precious stash of REAL FEEDSACKS! She loves to rummage in that box and make little things. I often make her things like this so she can enjoy these vintage treasures. Today it is pouring down with some serious April showers. But that's what the flowers love and we have to give preference to those things that bring us beauty in life, right? 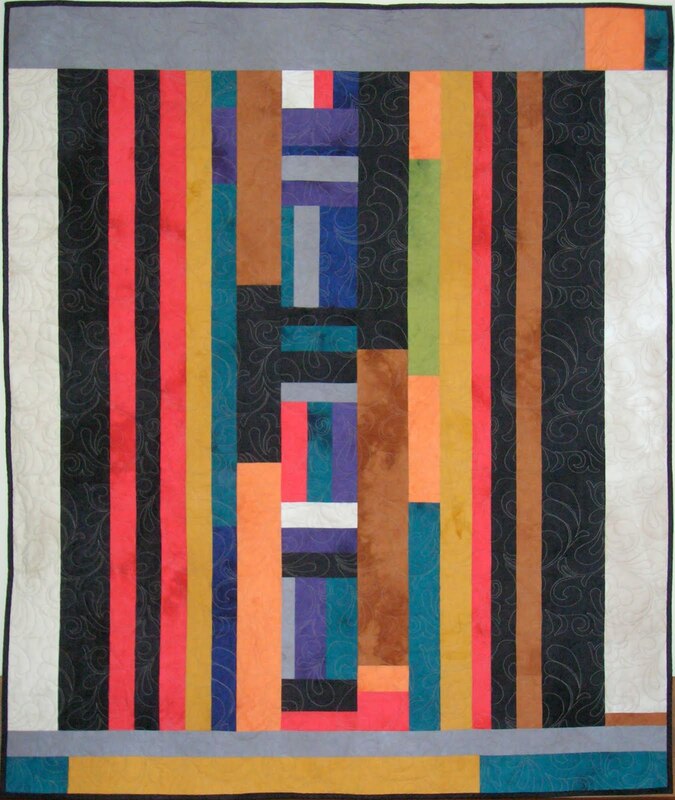 Doing research into the historical Orange Peel patterns and remembered this little quilt I made in 2003. Since gone to live with some little girl, I think. 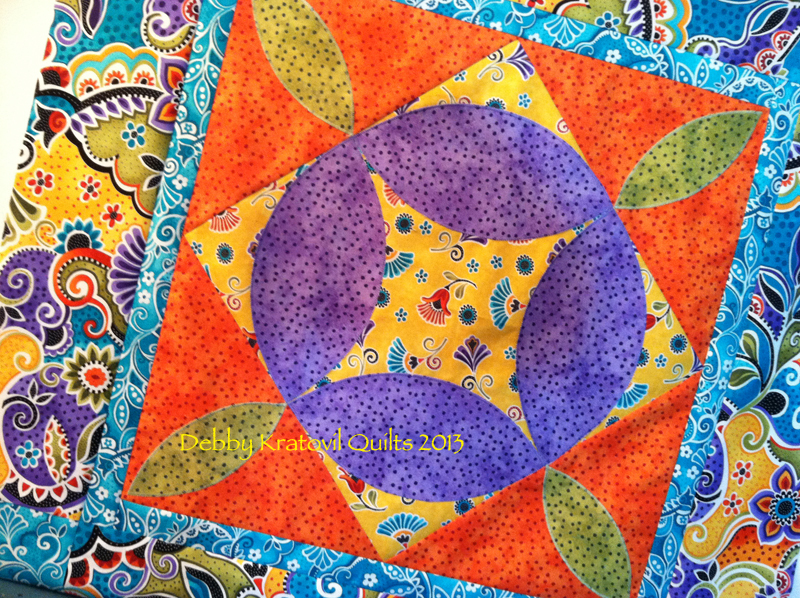 This basic petal shape can become so many blocks: Joseph's Coat, Pumpkin Seed, Petal. It's the shape of my EZ Double Wedding Ring two-template acrylic set. Now back to my research. Just had to add some eye candy to my blog today. I've been traveling for 6 weeks and it's good to be home for more than 3 days at a time. 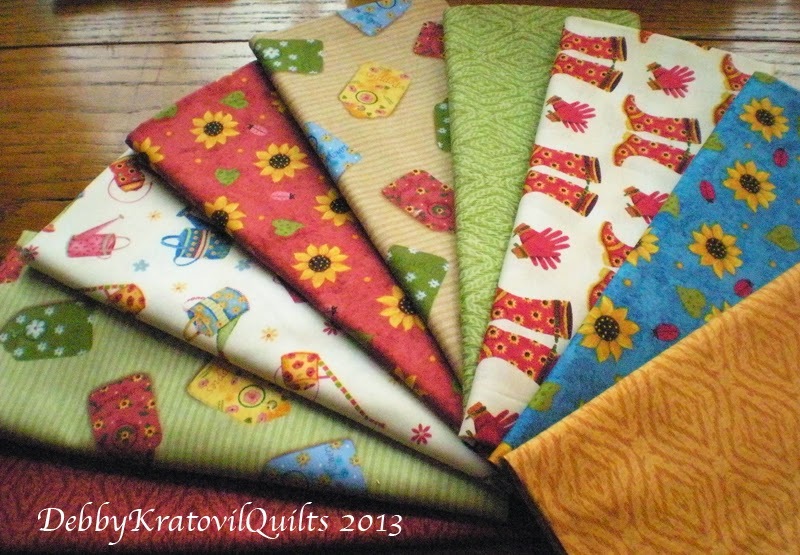 Sewing machine and stash - here I come!